It is not fair to say that athletics is a sport mired in crisis. As the World Championships begin here in Beijing, it is a sport mired in several crises, all at the same time. This has been a harrowing month for track and field, in an era when the sport is already struggling to hang on to the fascination and trust of the wider sporting public. No matter that the majority of its stars are clean, or that performances both extraordinary and legitimate will light up the next nine days of competition in China. The International Association of Athletics Federations (IAAF), the global governing body, announced it had suspended 28 athletes for doping offences committed at the 2005 and 2007 World Championships. The Sunday Times and German broadcaster ARD/WDR claimed a third of the medals won in endurance events at the Olympics and Worlds between 2001 and 2012 were won by athletes who have recorded suspicious drugs tests. Olympic 1500m champion Asli Cakir Alptekin was stripped of her gold medal for doping. For Lord Coe, newly elected to the post of IAAF president after the controversial 16-year reign of Lamine Diack, the start of actual competition cannot come fast enough. Yet even when it does, the clouds over his sport may continue to darken before they begin to clear. What makes a perfect heptathlete? Saturday sees the first round of the men's 100m, the highest profile of any event at a Worlds, Sunday its conclusion. The clear favourite for gold? Justin Gatlin, twice suspended for doping offences, running times that no man his age has ever done. Seven years ago the Bird's Nest stadium saw the ascension of Usain Bolt from brilliant young sprinter to the biggest star in world sport, his world records over 100m and 200m the defining moments of those 2008 Olympics. Ever since then the sport has leaned heavily on him whenever it has stumbled under scandal. Now, with Gatlin arriving in Beijing on a 27-race unbeaten run stretching back two years, its need for Bolt has never been greater, just as his ability to respond has never been less certain. For Bolt has barely competed this summer while Gatlin has been winning everything in sight. A pelvic problem cost him key training and big races; his 9.87 seconds at the Anniversary Games came as both a relief to his fans and also something of a shock. Bolt may still be the reigning world record holder in both the sprints. But while Gatlin has set five new personal bests since turning 32, only one of Bolt's 10 fastest times over 100m has come in the last three seasons. Then there is the supporting cast: Asafa Powell, the second fastest man in the world this year; former world champion Tyson Gay; another American, Mike Rodgers. All three have served doping bans; all three could end up on the podium alongside the pantomime villain that is Gatlin. For Britain, the three heroes of Super Saturday at London 2012 are back to fight again in a city which holds memories of disappointment and pain. Jessica Ennis-Hill missed those Beijing Olympics through injury. Mo Farah lasted only as long as the 5,000m heats, where he went out after finishing only sixth. Greg Rutherford, after managing only 10th in the long jump final, was taken to hospital the following day with kidney and lung infections. Each has their own distinct battle. Farah, in a summer that has seen his coach Alberto Salazar accused of doping another of his athletes, Galen Rupp - accusations Salazar denies, and in which Farah has never been implicated - has not lost over 10,000m since the Worlds in Daegu four years ago. Should he retain that title on Saturday, and then go on to match it with 5,000m gold a week later, he will feel his decision to stick with the controversial American has been justified. Rutherford, meanwhile, is looking to join another elite band by becoming only the fifth British athlete to hold the European, Olympic, Commonwealth and world titles at the same time. Britain has never won a world medal of any colour in the long jump, but should Rutherford back up his fine Diamond League form (he has three wins on the circuit this summer, with two jumps beyond 8.30m in Stockholm alone) he will stand alongside Daley Thompson, Linford Christie, Sally Gunnell and Jonathan Edwards. Then there is Ennis-Hill, back competing after the birth of her son Reggie and up against precedent as well as Canadian favourite Brianne Theisen-Eaton and young compatriot Katarina Johnson-Thompson. No woman has successfully returned to multi-events after childbirth, and even a few months ago Ennis-Hill was uncertain whether she would be here in Beijing. But fourth place at the multi-events meet in Gotzis and signs that her old speed was returning at the Anniversary Games has persuaded her to rejoin battle, with a podium finish a real possibility even as it would also represent an achievement on a par with her gold in London three summers ago. There are other Britons looking to fly at the Bird's Nest - Christine Ohuruogu, reigning world 400m champion, Olympic champion here seven years ago even if her form this year has been characteristically slow in arriving; 18-year-old Morgan Lake, who will become the youngest athlete ever to represent Britain in an individual event at the World Championships when she takes part in the high jump; new 100m national record holder Dina Asher-Smith. Yet no final is as likely to showcase the more attractive side of athletics than the men's triple jump, where the battle between Cuba's Pedro Pablo Pichardo and the USA's Christian Taylor may end with Jonathan Edwards' 20-year-old world record in danger as well as a gold medal being won. There have already been 11 world records set this year across 10 events, indoors and out, but Edwards' record has always felt like one of the untouchables, ever since he became the first man in history to go over 18 metres at the Worlds in Gothenburg back in 1995. Now both Pichardo and Taylor have also gone past 18m, both in the same competition in Doha earlier this summer. In the men's pole vault France's Renaud Lavillenie may also have another world record on his mind, although first he must secure a debut world title despite having won nine major golds across the last five years. Two years ago in Moscow he was again the overwhelming favourite, only to fall to a shock defeat to Germany's Raphael Holzdeppe. There is the prospect of another mighty battle in the field events, with both Kenya's Julius Yego and Trinidad and Tobago's Olympic champion Keshorn Walcott having thrown the javelin beyond 90m this year - meaning the Czech Republic's Vitezslav Vesely will have his work cut out to hold on to his world title. Then there is the women's 5,000m, where another rivalry, this time between Ethiopian teammates Almaz Ayana and Genzebe Dibaba, could see another big record go, with Dibaba having already smashed the ancient 1500m world record this summer. But these are individual skirmishes in the bigger conflict. Should the focus still be on scandal and science rather than performances and podiums in 10 days' time, much of that detail, no matter how impressive, will be in danger of being lost. 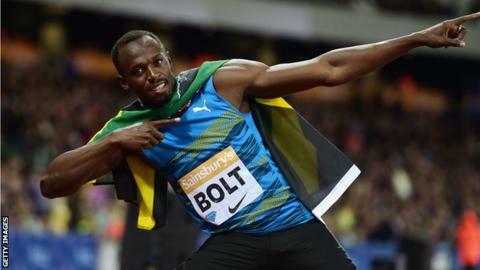 Athletics might need Bolt. But he is one superstar, no matter how heroic his deeds. It also needs a World Championship that is dominated by sport and sport alone. Only then can Coe's new regime push forward to fight the battles ahead.